We have all - at one time or another - answered our front doors to individuals from organisations asking us to subscribe, sponsor or buy a product on the spot. Where once this was seen as a means for such organisations or businesses to attain growth it is now seen as a possible means to obtain details about us which may be used for purposes other than that of which we are told. First of all it is important to recognise that most of these individuals are entirely legitimate and are who they say they are. However there have been - in recent years - cases where such individuals have not been entirely honest and have been availing of this means of selling in order to gain access to our personal details. Most door to door salesmen will display a badge or some form of identification that we - as householders - can check upon. However it is best to ask such individuals to show us their details more closely and also provide us with a company name, address, telephone number and supervisor's contact name. If they can do this on the spot then you should ask them to return later thus enabling you much needed time to check out their credentials. Where possible - if it is something you are genuinely interested in - you should contact the company and ask them to confirm not only the name of the individual who has visited you but also provide you with a description. If a cold caller cannot provide you with these details then you should refuse them both entry and also any details about you. Many charitable institutions will provide householders with bags for which to put any unwanted items in for collection. Although many see this as a good way of getting rid of clothing, books and electrical items they no longer have use for, many identity thieves see it as a way of gaining insight into your personal life. If you are intending to leave out such bags ensure that there is nothing in the pockets of any of the garments you are donating and ensure also that all electrical devices - especially mobile telephones - are wiped clean of any telephone numbers and data. Many charitable institutions will now ask for old mobile telephones to be recycled or reused so ensuring the memory and address books are clean is a must. Many gas and electrical suppliers send their employees door-to-door especially now as the market has become devoid of any monopoly. With this in mind you should beware of anyone who says they are operating on behalf of such an organisation. Again they will be - for the most part - genuine but it is best to be sure. With this in mind you should ask for their name, employee number and also a contact name and telephone number for their superior. Failure to provide you with this information should be enough for you to refuse them any information they may ask for. 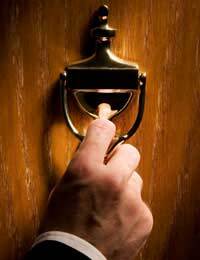 If you are in any doubt as to the legitimacy of any individual who knocks on your door then you should let them knock. This may perhaps sound rude but it is by far the best policy. The law now states that cold calling should only be carried out in certain circumstances and therefore the number of unsolicited sales calls you receive at your home should be greatly reduced. You should always check before opening the door to anyone you are not sure of. If - after checking - you are not convinced as to the legitimacy of their identification or reason for being there, do not open the door and ask them to leave. Signaling for another individual to witness them at the door or telling them you are calling the police should be enough for them to leave. Alternatively if you feel that they are not who they say they are it is worth while contacting your local police station and expressing your concerns.